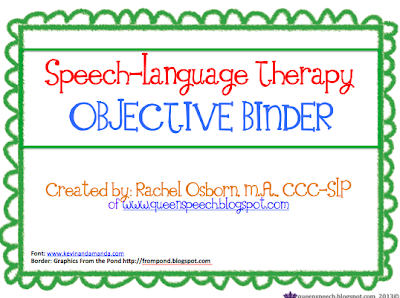 The Objective Binder is here! My objective binder was quite a hit! I decided to make it more appealing and update it. Click the image below to go to my TPT store! Descriptions of what the student is expected to be learning and why! 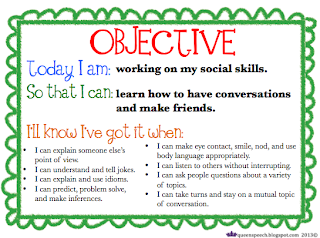 Includes objectives for: articulation, fluency, voice, social skills, asking/answering questions, retelling stories, pronouns, plurals, verb tenses, vocabulary and progress reports. Have something specific you want? My e-mail is located on the last page. 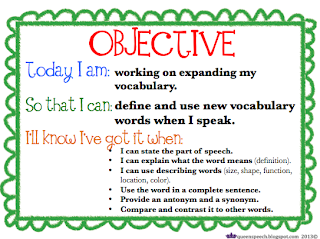 I will add 3 objectives to the document and send it back free! Thanks for your support and encouragement in this new endeavor! Love the update! I was so inspired by your original post that I created a similar binder with objectives for my caseload. 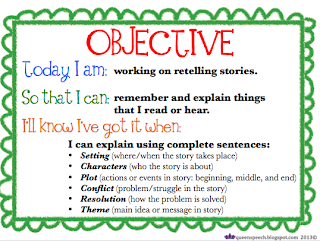 It's been so helpful with a bunch of my students! I'm a total fan of letting them in on the game plan! Thanks for sharing this fabulous idea!